A modern shout-out to western wear of the 60’s, introducing Bonanza – a stylish, crewneck pullover, with a detached fringed cowl collar! 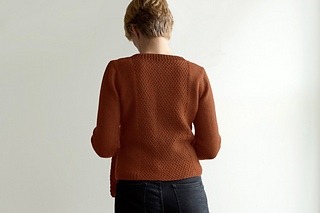 Worked overall in stockinette stitch with moss stitch adding texture to front and back panels this cropped piece extends high-hip in length with gentle shaping at the waist. 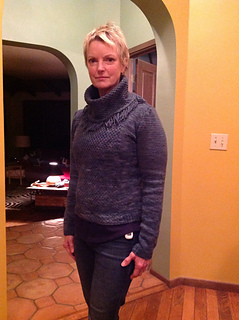 It’s worked bottom-up in the round to the armholes, then split and worked flat. 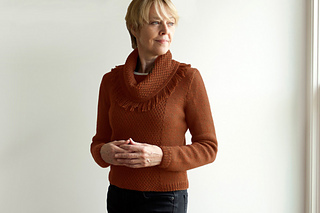 Long sleeves are worked bottom-up in the round and set-in. 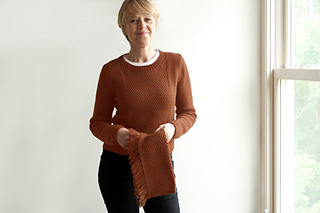 The matching cowl is worked flat, horizontally, grafted into a loop, then blocked and fringed – a fun new technique worked simply by unraveling its edges and trimming. Shown in Cascade 220 Heathers by Cascade Yarns (100% Peruvian Highland wool; 220 yds / 200 m; 3½ oz / 100 g skein); color – Pumpkin Spice #2453; 5, 6, 6, 7, 7, 8, 8, 9 skeins, or for comparable yarn, approx 1180, 1290, 1390, 1490, 1610, 1730, 1830 yards / 1080, 1180, 1271, 1363, 1473, 1582, 1674 m. I always have a little extra on-hand for swatching. 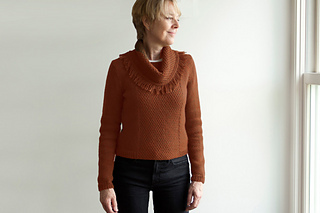 Long-tail CO, circular knitting, decreasing (ssk, k2tog, p2tog, p2tog tbl), increasing (m1L, m1R), short row shaping, and 3-needle BO (shoulders), stitch pickup around neckline, blocking, and seaming (sleeve cap into armholes). 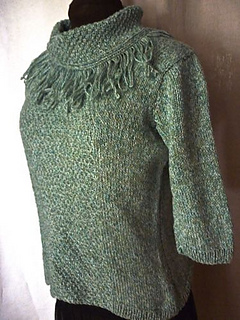 Collar requires provisional CO and grafting moss stitch – an alternative method for both using waste knitting is provided. 11 page pdf includes pattern instructions, photographs, schematics, a photo tutorial for creating fringe and definitions for relevant abbreviations.